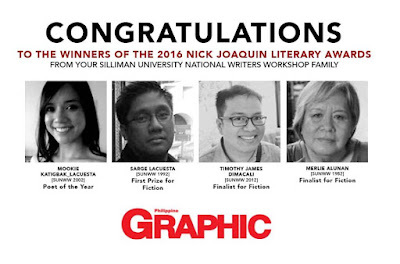 The Nick Joaquin Literary Awards of the Philippines Graphic magazine has announced its winners and finalists for 2016. 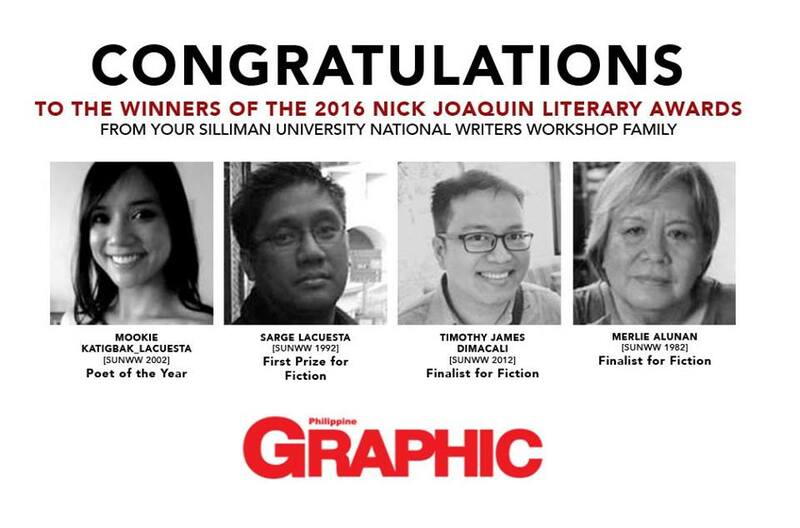 Congratulations to Fiction winners Sarge Lacuesta, "Coral Cove" (First Prize), Kate Osias, "Silang" (Second Prize), and Celestine Marie Gaspar Trinidad, "Giving Lives" (Third Prize). Poet of the Year title goes to Mookie Katigbak Lacuesta. Here are the three (3) honorable mentions for fiction: "The Sundays in Dapitan" by Timothy James Dimacali, "One Truck Driver's Story" by Merlie Alunan, and "Tooth, Scale, and Claw" by Ethan Chua. This year's NJLA Judges are Krip Yuson, Susan S. Lara and Cristina Pantoja Hidalgo. Alma Anonas-Carpio is the current literary editor of the Philippines Graphic magazine.